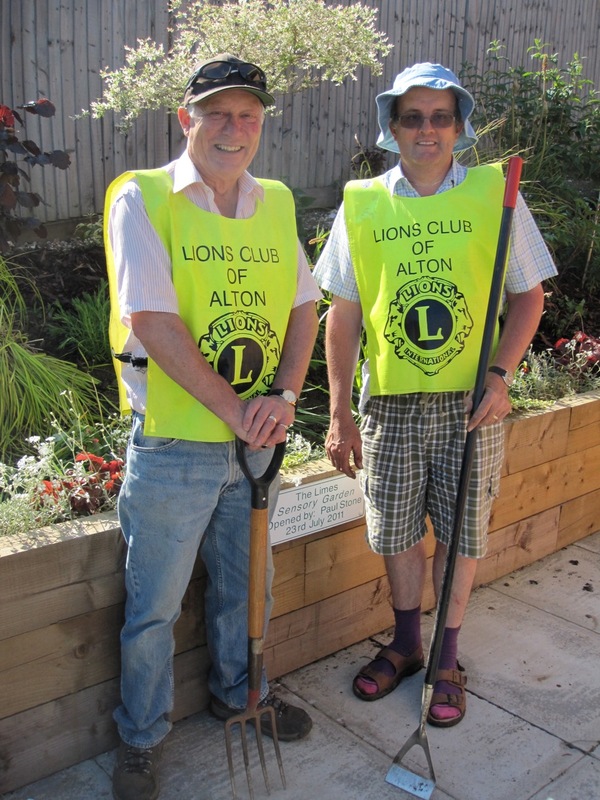 It was one of the hottest Saturdays of the year when Alton Lions Brian Lazenby and David Warner carried out maintenance work in the Sensory Garden at the Limes Day Centre in Alton. The maintenance included basic weeding, removing dead or dying vegetation and replacing with new and longer lasting plants. The whole area was then covered with tree bark to reduce weed growth and make the garden maintenance more manageable. Lion David, who is a landscape gardener and Mrs. Sheena Baker the Limes Day Centre Warden, devised the upkeep plan. The Limes is part of ‘Age Concern Hampshire’ that provides day care to enable older people to maintain their optimum independence and live in the environment of their choosing. Age Concern has more than 25 years experience and adopts up to date practices of care that meet quality standards. The sensory garden has been designed to provide the service users at the Limes with individual and combined sensory opportunities that the user may no longer normally experience. Warden Sheena provided cool drinks during the day and expressed sincere thanks to Alton Lions for their work and for providing the funds for new plants and the tree bark. Photo – Lions Brian (left) and David with the sensory garden in the background.